The Tailored Look: The New Color Trend for Men...Are You Ready? The New Color Trend for Men...Are You Ready? Most people have never heard the word peahen. (it's a female peafowl) Most people have never even heard the word peafowl (a species of bird in the pheasant family). Want to know why? No one talks about the peahen because their feathers are typically grey and/or brown and most people don't remember stuff that is grey and/or bown. Why? Because grey and brown are boring. 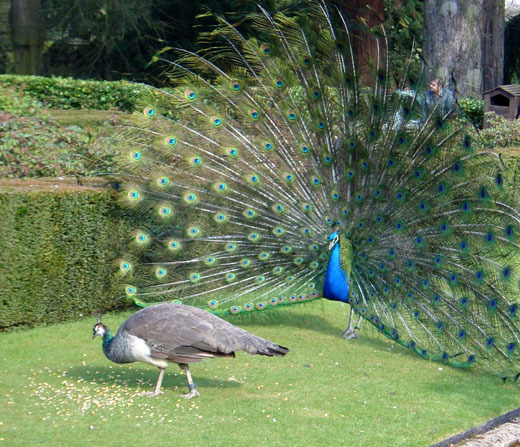 The word "peacock", however, is very well recognized. Most people will immediately associate the bright blue and green colors and the elaborate eye spotted tail and with the peacock. There are two take-aways here people...#1: the brightly colored peacock is the male of the species and #2: he is very memorable. Sorry for the long setup there, but all of that was a lead in to one of the newest trends in menswear...if you guessed color then give yourself a pat on the back. This summer saw men's chinos and jeans offered in every color of the rainbow. Last month's Mrket show in Manhattan showed the trend continuing into next Summer, and expanded into colorful blazers as well as a few other new places. If you feel overwhelmed by all these bright colors, or feel that you can't pull it off, do not fret. Start with something in a muted shade like a good old pair of faded Nantucket reds. Before you know it, you'll be ditching your boring khakis for bright red and wearing them with a sport jacket and loafers! A word of caution: Be careful with the colors. There is such a thing as too much color and there are occasions where this current trend should not be applied. If you're gonna wear brightly colored pants, tone it down with a softer neutral colored shirt or jacket - no need to go all Christmas tree on us. Also, if you're interviewing for an accounting position with a conservative firm: WEAR A BORING GRAY SUIT!